Hi having a change in my tank selling my shrimps and getting a porcupine puffer and dogface will they pick at my leather fingers and toadstools????? Great idea didn't want to go fowlr . 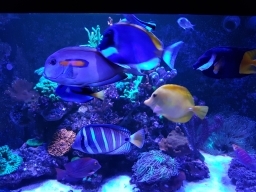 Will also add a small emporer and majestic angelfish .